Gravitate toward your next great adventure at Gaylord Opryland Resort & Convention Center. 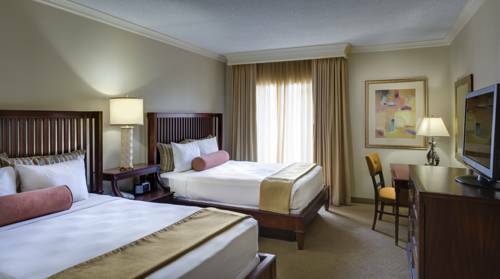 Situated in the heart of Nashville, our luxury hotel allows you to hit all the high notes of Music City both in the area and under our roof. Looking to make a splash? SoundWaves, an upscale water experience featuring 4 acres of combined indoor and outdoor water attractions, is scheduled to open right on site in December 2018. Catch a show at Grand Ole Opry and Ryman Auditorium, then return to our 9 acres of lush indoor gardens and cascading waterfalls. We also offer a full-service spa for a more relaxing way to unwind. When it's time to refuel, sip and savor in our stylish steak, Mexican, Italian and Japanese restaurants followed by a frozen yogurt or gelato dessert. When it's time to conduct business, inspire new ideas when you take advantage of over 750,000 square feet of inspiring meeting space. Discover our impressive lineup of amenities when you reserve a getaway at Gaylord Opryland Resort & Convention Center. Cascades American Cafe: Cascades American Cafe serves modern versions of classic American dishes in a dramatic atrium setting surrounded by soothing waterfalls. Start or end your day in Nashville in this one-of-a-kind restaurant where parking is validated. Fuse Sports Bar: Watch the big game at Fuse Sports Bar, which offers more than 100 high-definition TVs and a variety of tailgate-inspired dishes. Parking is validated at this eatery. Delta Marketplace: Perfect for on-the-go guests, our marketplace in the Delta Atrium serves a wide array of coffee and beverages, breakfast items, salads, sandwiches, snacks and more to help you start your day in Nashville satisfied. Conservatory Cafe: This restaurant offers breakfast, sandwiches, wraps, salads and desserts at the Magnolia entrance to the Garden Conservatory Atrium. We also proudly serve Starbucks beverages. Jack Daniel's: Experience the fine tradition of the great Southern food Nashville is known for. Sample hand-selected Tennessee Sippin Whiskey from the distillery, located in Magnolia section. Parking is validated here. Findley's: Findley's features an antique wooden bar and wide selection of craft beers, making it the perfect place to unwind in Magnolia. Parking is validated. Old Hickory Steakhouse: A nod to President Andrew Jackson s nickname, our signature steak restaurant features 1855 Black Angus Beef seared to perfection, plus artisan cheeses and an extensive wine list in Delta Atrium. Parking is validated. Ravello: Enjoy an Italian dinner inspired by the coastal city of Ravello on the lower level of our Garden Conservatory Atrium. Parking is validated. Paisano's Pizzaria & Vino: This festive yet casual restaurant serves up Tuscan-style pizza and pasta, freshly baked bread sticks and fresh salads on the Delta Island. Stax: Create a juicy, one-of-a-kind burger or sandwich just the way you want it when you choose the size and sides at this restaurant on the Delta Island. Solario Cantina: Enjoy bold Mexican flavors, signature margaritas and more than 100 tequilas at this festive bar and restaurant. Located in Garden Conservatory Atrium. Parking validated. Wasabi's Sushi: Japanese-style sushi and a broad selection of traditional sake and beer are served amidst lazily swimming koi and the soothing sound of waterfalls inside the Cascades American Caf . Located in the Cascades Atrium. Parking validated. Cocoa Bean: Choose from premium coffee drinks, fresh bakery and pastry items, and gourmet sandwiches at our signature coffee bar overlooking the twin falls in the Cascades Atrium. Located off the Cascades Lobby. We Proudly Serve Starbucks . The Falls Bar & Lounge: Enjoy a tapas-style menu, wines, hand-crafted cocktails, bottled beer and chilled champagne in a breathtaking setting overlooking twin waterfalls. Located in the Cascades Atrium. Conservatory Wine Bar: Conservatory Wine Bar offers a diverse selection of domestic and international wines in a sophisticated, chic setting. Located in Garden Conservatory Atrium. Library Lounge at Old Hickory Steakhouse: Sip on classic and modern cocktails, cognac, whiskey, wine or beer at this unassuming yet decidedly upscale speakeasy. Located in the Delta Atrium. American Craft Tavern: Taste authentic American beer, wine, whiskey and snacks in a modern, industrial themed bar setting. Located in the Delta Atrium. Delta Delight Frozen Yogurt: Pick your frozen yogurt and pile on the toppings to create a one-of-a-kind sweet treat. Located in the Delta Atrium. Bravo Gelato: Satisfy your sweet tooth with Italian gelato. Located at the Magnolia entrance to the Garden Conservatory Atrium.